Most Credit & Debit Cards Accepted & Paypal. Items will be dispatched within twenty four hours of Payment. In order to cancel the contract you must..... Inform us of your intent to return the goods within seven working days of the date that the goods are delivered and must return them at your expense in the condition that they were supplied, complete and in 'as new' condition e.g if you have opened the box to examine the product you must have done so without damaging or marking the product or packaging in any way. (A charge may be made to bring the item back to as new condition). Goods should be returned with the original box, packing and all accessories. Any FREE gifts received with the product must also be returned intact. In the event that the buyer suspects the item to be faulty, a return may be arranged a refund/replacement will be offered subject to our inspection & test by our qualified engineer. The buyer must contact us first before returning the item. We are always happy to advise you if you are having any problems. 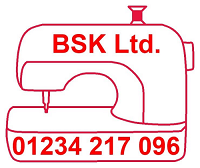 BSK Ltd have been retailers of knitting and sewing machines since 1969. We also have a retail shop at BSK Ltd, Units 8&9 Murdock Road, Manton Industrial Estate, Bedford, MK41 7LE and we also have our own website, also we are one of the largest Mail order companies for Knitting, Sewing, and Embroidery Machines, yarns, accessories etc. We use a qualified knitting machine engineer and a qualified Sewing Machine Engineer. We have one of the largest ranges of second hand & new spares for Brother knitting machines in the country. We are back up to Brother for spares for Brother Knitting, Sewing and Embroidery Machines. Any item we offer for sale has been thoroughly checked and tested. We are always happy to advise you of the suitability of products that we offer for your needs, just email and we will advise you. We always aim to ensure that all our customers are fully satisfied. We will always answer every question and do our utmost to resolve any problems.